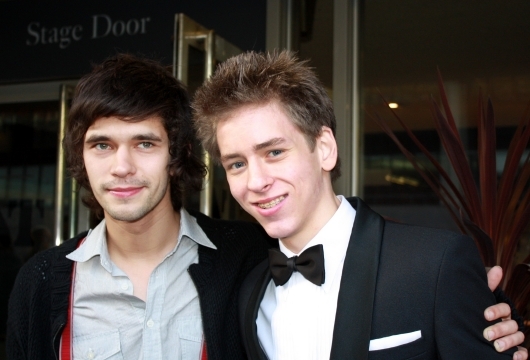 I met Ben Whishaw by chance in October 2008, outside the stage door of the National Theatre in London, where he was performing in the play Some Trace of Her. I was there for Sir Roger Moore's book signing and jumped at the opportunity to have my photo taken with the star of the BBC drama Criminal Justice. 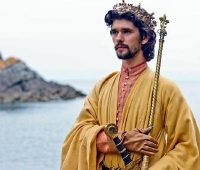 Ben Whishaw is widely regarded as one of Britain's most talented young actors. Ben then trained at RADA graduating in 2004. He was cast as Hamlet in Trevor Nunn's highly successful 2004 production at London's Old Vic. His performance, which caused much audience excitement because of his youth and inexperience, drew universal praise from the critics. Edinburgh Festival in 1995, with Ben Whishaw getting rave reviews for his performance. Chekhov's The Seagull at London's National Theatre in 2006; another Philip Ridley play Leaves of Glass at the Soho Theatre in 2007, and Some Trace of Her (a version of Dostoevsky’s 1869 classic novel, The Idiot) at the National Theatre in 2008. 'most promising newcomer' for his lead performance in My Brother Tom (2001), in which he appeared as an abused teenager who frolicked, wild and naked, in the woods with a girl who had been abused by her next-door neighbour, who was also her school drama teacher . Ben's early film appearances include Enduring Love (2004) and Layer Cake (2004), both starring Daniel Craig, and the Rolling Stones film Stoned (2005) in which he plays Keith Richards. were thought to have been considered to play the lead character, but the German director Tom Tykwer wanted an ‘unknown’ actor, and Ben Whishaw eventually got the part. I'm Not There (2007) is a very complex biopic in which Ben Whishaw is one of six different actors (including Cate Blanchette, Richard Gere and Heath Ledger) to play an incarnation of the folk singer Bob Dylan. International (2009), and the comedy short Love Hate (2009). In the romantic drama Bright Star (2009), Ben is cast as the 19th century poet John Keats, with Abbie Cornish as Fanny Brawne. Jane Campion has written the screenplay and also directed this visually stunning film. The drama is based on the three-year romance between the poet and Fanny Brawne, which was cut short by Keats' untimely death aged 25. Ben Whishaw's TV credits include Pingu in the sitcom Nathan Barley (2005) and the substantial role of Ben Coulter in the BBC's 5-episode production of Criminal Justice (2008). and talk to friends about it. It was something I felt I had to do. The story has a nightmarish quality - it's complex and challenging. I felt it would challenge me in big ways." Ben Whishaw lives in London and enjoys reading, painting and gardening in his spare time. Shakespeare's historical plays for the BBC's Cultural Olympiad. More success followed with the BBC's drama series The Hour (2011-12), an espionage thriller set in England during the Cold War of the 1960s. Whishaw stars as journalist Freddie Lyon, alongside Dominic West as Hector Madden and Ramola Garai as Bel Rowley. The series has been nominated for a number of awards including the BAFTAs and the Golden Globes. (2012), starring Daniel Craig as Bond, Ben Whishaw was cast in the role of Q. Ian Fleming's recurring character, who didn't appear in either Casino Royale (2006) or Quantum of Solace (2008), had previously been played by Peter Burton (1962), Desmond Llewellyn (from 1963-1999) & John Cleese (from 1999-2002).